Favorite food: Blue Spa, carrots, most fruits and veggies, Charley Bears. Favorite toy: The cats' plus the cats' toys with catnip - yum! My Kongs, Petstages toys, agility tunnel, Holee roller, sandbox, balls. Bailey and Josh. Favorite activity: ZOOOOOMING! Riding in the car. Barking at the cats, all three of them. Taking a shower. Napping on the shelf of the cocktail table in the family room. Protecting my house! Special talents: I am my mommy's seizure alert dog. Dancing with Granmy. Being a social butterfly. 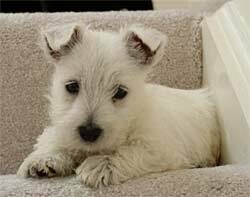 Most embarrassing moment: I am a Westie, I never get embarassed. Most trouble I ever got into: Running away at Granmy's in the dark. I ran through backyards, frontyards and across the street and wouldn't listen to anyone calling me. I miss my dear Furby and friend Sailor. Biggest adventure: Going to Granmy's house, she spoils me crazy! And there's more cats there!! !